The tribute to Safi Faye at the 32nd Festival International de Films de Femmes (2-11 April 2010) demonstrates once again the important place she holds as pioneer in the history of women in cinema. Invited internationally to share her experiences in cinema, Safi Faye often reflects on the environment during that time, nearly forty years ago, in the early 1970s. She recalls the curiosity of her European colleagues in the midst of the “first African woman to dare to make a film." 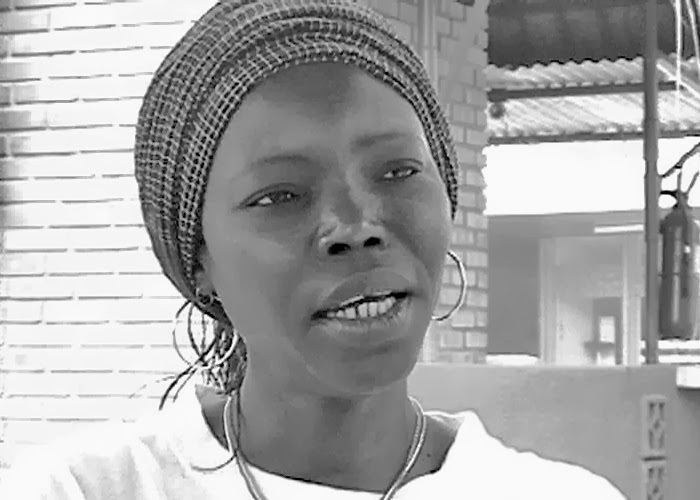 In the April 2010 article, "Le 32e Festival International de Films de Femmes rend hommage à Safi Faye”, Claire Diao recounts the moving reception for Safi Faye, the guest of honor, among the other women who were also recognized, each receiving a rose. Safi Faye is introduced as “la grande référence” as she is welcomed on stage to a round of applause as she accepts a bouquet of flowers. Included below are texts of English translations from French of two video clips of the visual documentation of the event, included on the DailyMotion FilmFemmes Channel. The first text, Safi Faye, la grande référence, which includes the video-clip, is the English translation of the video-taped presentation of excerpts of the Gala event. The approximately five-minute clip is part of a longer video document. The begin and end time are as follows: 4:19 - 8:54. The second text, Safi Faye's Cinema Lesson, which includes the video-clip, is the English translation of the 10-minute video-taped interview with Safi Faye entitled “Leçon de Cinéma de Safi Faye” (Safi Faye’s Cinema Lesson), which is part of the series “Leçon de Cinéma” (Cinema Lesson) a collection of conversations with the most emblematic women filmmakers of the last decade produced by the Festival International de Films de Femmes. Whether immigration or travel between the two continents, Europe and Africa, the 32nd edition of the Festival International de Films de Femmes welcomes a number of films this year that reflect this fusion of two worlds. Saturday, the section “Trans-Europe-Africa” opens its doors in the presence of Safi Faye, who has honored us with the presentation of her film “Peasant Letter”. The filmmakers from the section, Trans-Europe-Africa : Alla Kovgan, Moira Tierney, Nadia El Fani, Christiane Chabi Kao, Lucie Thierry, Nicoletta Fagiolo, Pascale Obolo, Halida Boughriet, Safi Faye [she rises from her seat]. Participants : Tonikara is an association of African women from Mont Mesly [a suburb of Paris near Creteil, where the Festival is held]. Each year we participate in the festival in order to watch the films. My dream is to present a film at the festival one day. This evening is dedicated to Africa, to the African filmmakers, and our section Trans-Europe-Africa. For us, Safi Faye is an important role model. In order for African filmmakers to exist, to be able to show their films and lead a tough fight, they sometimes work in isolation, but they also have a great deal of courage, tenacity and talent. Through my research I was able to understand the struggles and concerns of the people of the region from where I come, the peasantry, which are my roots. I pointed out the aspects most open to criticism regarding the conditions of my rural world, which culminated with the film Peasant Letter. We made the filmed as a documentary, live, on the spot. We stockpiled bits of unused film and went out to shoot with these little bits of film that we found here and there, as well as from the Louis Lumière Film School from the film shot in 1973. Then in 1974 we realized that we had to create a story around the conditions of this rural life. Thus, we formulated the story of Coumba and Ngor. When we returned to shoot in 1974 we found that Ngor’s shirt was in tatters. So we went about repairing the sleeves. The film was rescued because it was shot in black and white. If it had been shot in color the flaws would have been visible. I had a technical crew at the Louis Lumière Film School eager to have an experience in Africa, and ready to follow me wherever I needed to go. For each image, each shot, there was only one take. The horses and donkeys refused to obey in the presence of the camera. Therefore, nothing could be cut, as the scenes could not be shot twice. This is the first time that I saw this film on a large screen and I am seeing again practically my entire family, who have since gone, they are almost all deceased. So this is an emotional moment. They were the people who supported me, who encouraged me—as a woman—to always be ready to work. I come from a matriarchal society, and well, I am a bit touched by all of this. When I arrived in France I lived in the Latin Quarter. Lots of people asked me questions about Africa, for which I had no answer. Because, like you, I learned that Louis XIV was the greatest king of France and I learned the works of Baudelaire and Rousseau, and many others. I realized that I had to deepen my knowledge about Africa. And since all of the specialists were in Europe—Germany and France—all the Africanists were European—who taught me once again about Africa. I wanted to understand the influence of the spirits in indigenous African religions. Therefore, I based all of my studies in anthropology and ethnology on religion, which I call, “primitive” but I will not allow westerners to call it “primitive”. People have always connected me with Jean Rouch. Jean Rouch was my French father. I met him in 1966, during the First World Festival of Black Arts when I was a young teacher. He told me that I was very charming and that he would like for me to act in his film. Since I was a teacher my father called to tell him that we could only shoot during the Christmas and Easter holidays. And for three years, during the Christmas and Easter vacations we shot the film and I traveled the world. But as I always say, there is the impression that Africans can do nothing without an overseer. Rouch never said that it was because of him that I am a filmmaker and neither have I made that assertion. People make up things, and Africa ends up being viewed in simplistic terms. I have made many documentaries, docu-dramas, re-enacted, but never with a large mise-en-scène. Around these elements a narrative comes together, often a little love story that connects it. I chose the rural world because I am from the peasantry. My father went to school for a short time; my mother, never. These were the peasants who went to the city to work. My father came back to the village when he was 89 years old, my mother at 72. I wanted to highlight this world, which is the only sector that can actually make Africa self-sufficient, so that it can feed itself. We do not have industries or oil. Therefore, we must farm the land so that future generations of children may eat. I have underscored the rural problem in every way. I have been unrelenting because I am from the peasantry; I am not from the city. People say all the time, “Safi, the documentarist, she makes documentaries, docu-dramas, (or whatever other new terms), but never fiction films.” I said to myself, well now I will see what this fiction really is. I began to write, search for innovative images—but I am still not convinced that this is fiction. I view fiction in the context of science fiction or war films. I wrote the script, I edited it, I sketched out the images, I asked others their thoughts. And after having completed Mossane, I am not yet persuaded that I have made a fiction film, because my imagination comes from what I have lived, the values that have been instilled in me, the education that I was given. And I think for an African it is very difficult to put a boundary between the fiction and the documentary. Mossane was not conceived solely by me. If these beautiful images come out of an Africa full of misery and struggle it is because the greatest of German cinematographers, Jürgen Jürges, Fassbinder’s director of photography, read my story, liked it and filmed it. As we both had fourteen-year-old daughters, our love for them was transported onto Mossane. We had a mutual feeling of how we envisioned Mossane. I learned many things during the process. During two years before the shooting of Mossane we went to Senegal to study the lighting and the colors in order to be as close as possible to the story that I had written. I wanted the young girl to be the blackest of black, a blue black. She is so beautiful that the spirits, whose parents died very young, long, long ago, heard about the birth of the most beautiful girl in the world, and came back among the humans to take her away. Mossane did not commit suicide; Mossane followed her destiny. The ancestors came back in search for her, and took her back with them. I set out with this idea and that is what excited me, because I had never seen a visualization of the ancestors and I found an original image in cinema: the dead will return upside down. Until 1996, I refused to go to festivals, I stayed to myself. People can watch my film and need not have me around. Because I have always felt that a film belongs to the public. It is a bit anguishing for me to be here. One need not explain her conceptualization, her process. The film—either one likes it or not. The story—you like it or you don’t. Yes, Safi Faye, who I had the honour to meet at the Creteil Festival,(she was opening the festival with Moussane and I was opening the African Women's Panorama with "The Battle of the Sacred Tree")inspired me to go ahead and study filmmaking. I saw all her available films in Berlin. I would like to show her films at the Kenya International Film Festival, especially all of them. How can I access them?